The premise is likable enough, and so is the idea that the monster is going to tell three stories, only just like the movie, the stories start getting worse and worse, and putting in less effort each time, adding to the feeling that the movie does run out of steam. This is an interesting movie that just doesn’t work the whole way through. It’s about a boy who is losing his mother to cancer and has a monster come and visit him, promising to tell the boy three stories. The stories start out great, but they slowly get worse as the movie goes on to the point where the last story is barely told at all. The same can be said of most things in this movie. They start out great, but then there’s little to no follow-through. There’s a great situation with Conor destroying things in someone’s house, for example. The scene works because the viewer anticipates what will happen when the person arrives home. But the actual arrival and reaction once the person does get there, just doesn’t measure up to the build-up. If the stories are meant to be deep and to work on a symbolic level, then they needed more. Either to be more clear, or at least to make a little more sense. The artistic elements of this movie are good, but the storytelling could have been a lot better. A Monster Calls is an okay movie. It’s a film that had a cool premise, some great visuals, and a lot of momentum. But then little by little, it loses that momentum as the film goes on. The movie deals with the telling of three stories, and while the first story starts out great, the others get progressively worse. This is representative of the entire movie, as it starts off telling a pretty powerful story with incredibly artistic detail, and slowly loses its creativity. To put it simply, the story telling goes from giving us a great story, to an okay story, to no story at all (no visuals for the third story.) The movie feels the same way. What we have here is the story of a boy named Conor, living at home, in England, with his sickly mother, (played by Felicity Jones.) She’s dying of cancer. His strict grandmother (played by Sigourney Weaver,) comes over one day to help take care of the mother, and we immediately sense the different relationships Conor has with each of these women. He fears his grandmother and does not like her at all. While his mother has a gentle touch and encourages Conor in all areas of his creativity and free expression, the grandmother is all about rules and obedience. But Conor’s problems don’t stop there. 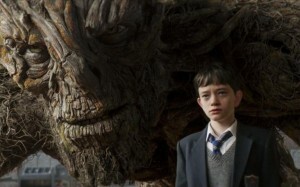 At school, he is seen as an outcast by his peers, as he refuse to pay attention in school, choosing to escape into a fantasy world of his own artwork instead. And Conor finds himself being constantly bullied by a group of boys who see him as an easy target. So far, all of this is kind of routine storytelling. Especially the bully part. But what makes the movie special is the monster angle. At 12:07 a monster forms up from the ground, composed of the parts of trees, and walks over to Conor’s window. The formation of the monster is really cool. I love how the movie takes its time with this to get artistic. And when the monster shows up, you think he’s about to threaten Conor. Instead he says that he has come to tell Conor three stories. Now this is a very creative angle, like the three ghosts in A Christmas Carol. One would think, at this point, that the three stories will be very different from each other and each present a new way of looking at things. It’s in the three stories that the movie both lives and dies. It reaches its greatest heights of success here, but also ends up plummeting to its greatest failures. The deal is that after the monster tells Conor three stories, Conor will tell the monster one truth, and it will be the truth behind his nightmares. These nightmares feature the ground falling apart all around him as he hangs over the edge of a cliff, holding onto someone’s hand, trying to save the person. The nightmares and the monster are clearly related, and the movie wants us to think that there’s a mystery here, figuring out the way that all these puzzle pieces fit together. Something like the Wizard of Oz, where all the people back home on the farm in Kansas represented characters Dorothy met in Oz. Only that movie didn’t tell us that there was a mystery for us to figure out. It didn’t announce the puzzle. It wasn’t a situation where we were told the characters represented something, in an attempt to get us curious. The ending worked because you never saw it coming. 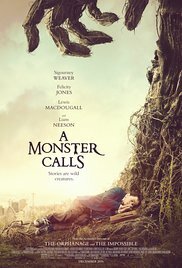 With A Monster Calls, it’s the exact opposite. Whatever the meaning to Conor’s nightmare is, the movie wants us to figure it out through the series of stories that lead up to Conor’s telling us the “one truth”. The first story the monster tells is fantastic. In fact, perhaps it is so good, that it’s not really fair to the other stories. It’s about a prince and his father the king who marries an evil step mother, half the king’s age. The evil stepmother poisons her husband and then takes over full control of the kingdom. The young prince, who is in love with a farmer’s daughter, flees the land. He runs into the woods and falls asleep under a tree with his bride and he wakes up, the farmer’s daughter is dead. The queen got to her. Turns out the whole thing was a ruse. The Prince killed the farmer’s daughter to get sympathy from the people and to get them to see the queen as evil and overthrow her. Turns out she never poisoned the king at all. He just died because he was old. This is a very cool story, but it’s also told in an incredible way with silhouettes and images that form and come apart on the screen like the shadows of leaves. This story is told like a work of art and the fact that it also happens to be a great story with a twist ending just makes It all the better. The second of the monster’s stories is where that destruction comes in. Before it happens, the monster tells his story. Now, it should be noted that the first story, in which the evil stepmother turned out to not be evil at all, was probably about Conor’s grandmother. Starting with the second story, things get a littler harder to navigate or figure out. This story is about a medicine man and a preacher. The preacher runs the town. He gives sermons about how terrible to the medicine man is. Then one day his daughters take ill. He goes to the medicine man for help. The medicine man asks the preacher to renounce his claims about how bad the medicine man is. The preacher agrees, saying he will do anything to save his daughters, and that love is more important to him than anything else. So far so good, right? You expect the medicine man to forgive the preacher and say something like, “since you are willing to give up everything you believe in for love, I can tell that deep down inside, you are a truly good man.” No such luck. The medicine man does the opposite. He refuses to help and lets the girls die, saying the fact that the preacher was willing to give everything he believed up for his daughters means that he’s a phony. What a terrible ending. It’s a twist that makes no sense at all. Perhaps this story is also about the grandmother. After all, the story ends with the monster destroying the house of the preacher, and then Conor destroying the special room of the grandmother’s house. Maybe the idea here is that Conor wishes the grandmother changed her ways for him, once his mom became sick. She should have given up on some of her convictions, like preaching to Connor about how important the room and the grandfather clock were. But when you think about it in terms of the story, it’s kind of the exact opposite. The preacher did denounce his convictions, and look where it got him. So the story not only has a lousy ending, but it doesn’t exactly make sense or flow into reality smoothly. Still, it is at least an interesting story. That’s more than can be said about the last story. This one is about a man who is invisible to the world and gets tired of it. He doesn’t mind people being mean to him, but he does mind people pretending they don’t see him at all. This mirrors Conor’s situation exactly, when the bullies come up to him one day and tell him that they’re done bullying him. They can tell that he wants to be bullied, and they’ve decided to just not pay attention to him anymore. This makes Conor go nuts. He chases after the head bully, jumps on him, and beats him up. Conor wants to be noticed. He likes being strange and different to the point where he is okay with being beat up over it. But he’s not okay with people not noticing him. The problem with the last story is that it isn’t even shown at all. We just hear the monster tell it, and it really comes out to just one or two sentences. Perhaps the reason for this is that this story is more about Conor then it is about a fictional character, but even still, the visuals were what made the other stories so great, and by giving us no visual storytelling at all, with this third and final story, it comes off like the movie is just getting lazy. The final reveal, or truth behind Conor’s nightmares, is pretty cool, but it’s not enough. This movie has lost so much ground in its storytelling by the end, that it’s very hard to get back on track. Take the destruction of the grandmother’s house, for example. It’s an excellent scene, and there’s a lot of build-up to what will happen when the grandmother comes home and sees what Conor has done. Only when we finally get to the point, the result is disappointing. Conor and the grandmother never even address the issue of what happened. It’s obviously a message that nobody wants to punish Conor, because of everything he’s dealing with regarding his mother, (two different characters say the same thing to Conor after he asks about being punished, using the words, “what would be the point?”) but even still, at least a conversation between the grandmother and Conor, about what happened, would have been nice. That’s an example of how this movie is all build-up and not enough follow through. There are some very cool ideas here, like the three stories, but by the time we reach the last one, the movie has lost it’s effort and energy.